If you ever worked in Hong Kong, you would know many HK’ers get off work late, and quite often opt to eat out after their long stressful day. But I’m sure many of these HK’ers get sick of eating cha chaan tang‘s 3x a week, and prefer making something simple at home from time to time. And I am one of these typical HK’ers. Oven-baked salmon is my go-to-dish when I want something yummy and healthy, but don’t want to wash up too many dishes. Lemon and dill are my favorites with oven-baked salmon. Most kitchen’s in Hong Kong are small (sorry, I mean tiny), so many of us don’t have the luxury of a built-in convection oven. But I must say, a small counter-top oven is a must-have to make your life in the kitchen much easier. Or if those counter-top oven’s are too big for your HK kitchen, you can consider getting one of those recently-must-have halogen ovens. I’ve never tried the halogen ones, but I know quite a lot of friends who have them now… I’m yet to get a review from any of them. Toaster ovens are smaller, but I wouldn’t recommend them as most don’t have temperature adjustment. I also made a creamy dill sauce and a red onion and cucumber salad to go with the salmon. The best part of this recipe? No pots and pans to wash! Using aluminum foil, create a small pouch for the salmon. Be sure to fold up the foil so that no liquids leak out, and have enough foil to fold over the top of the salmon. Place the salmon inside the pouch, leaving 1-2 inches between each salmon. Pour the olive oil over each salmon. Cut the lemon in half and squeeze the juice over the salmon. Then add the chopped dill weed and a large pinch of salt and fresh ground pepper. Cut the remaining half of the lemon into thin slices and place over the salmon. Gently folder over the foil to close the pouch, making sure not to wrap the foil too tightly around the salmon. Place the salmon onto a baking tray and into the oven for 18-20 mins. 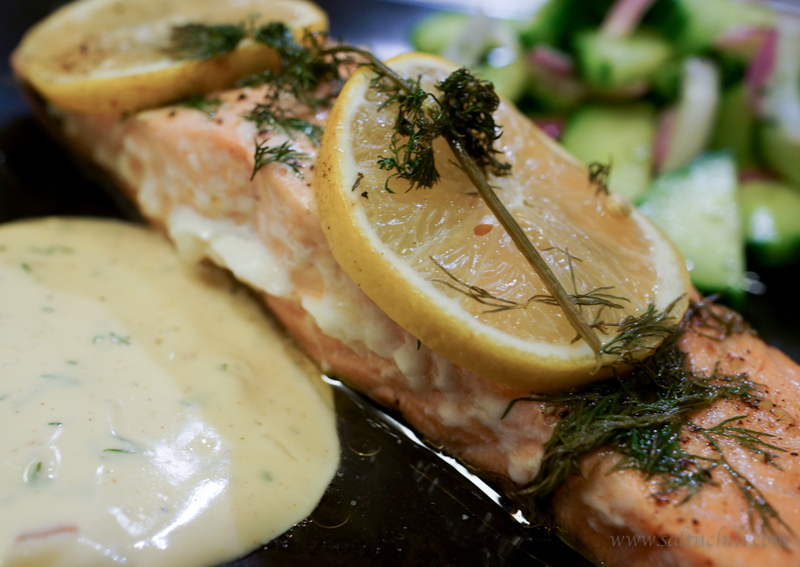 As the salmon is cooking, make the creamy dill sauce. Mix all the ingredients together until combined. Taste the mixture and adjust the seasoning to your preference. I like to add more dijon mustard because I love the tanginess. If you love dill weed, feel free to add more. I don’t add salt because the dijon mustard is quite salty, but if you like you can add a very small pinch.